I have a special affinity for the department store concept. Or at least I did, before I embraced the idea of not buying unnecessary items (either out of choice or lack of financial resources) and the big-box stores removed all the personality out of the idea of multiple categories of goods under one roof. That’s largely because I was raised in a Montgomery Ward family. That’s not the exclusive place we shopped, but it is where a significant portion of my family worked. My maternal grandmother worked at the national parts center in Berkeley, IL for a long while, with her daughter, my mother, following her there. Separately, my father worked in the same building (it’s where the two met) and would bounce between that location and the corporate headquarters in Chicago, just across the street from the original warehouse, for 30+ years, right up to the point the company went out of business. So it’s in that spirit that we turn our attention today to National Department Store Day. The day is meant to recognize the innovations the department store idea has spawned and the conveniences it has brought to consumers. Between Wards, Sears and J.C. Penney, Chicago is responsible for much of that innovation as the three stores took the products that sold well in their catalogs and began making them available in a single location for shoppers to browse through. To help celebrate, let’s look at the trailers for five movies that are set in department stores or, in a few cases, the shopping malls traditionally anchored by those larger stores. The story involves the planned sale of The Phelps Department Store and the crooked manager who fears the sale will expose his financial irregularities. 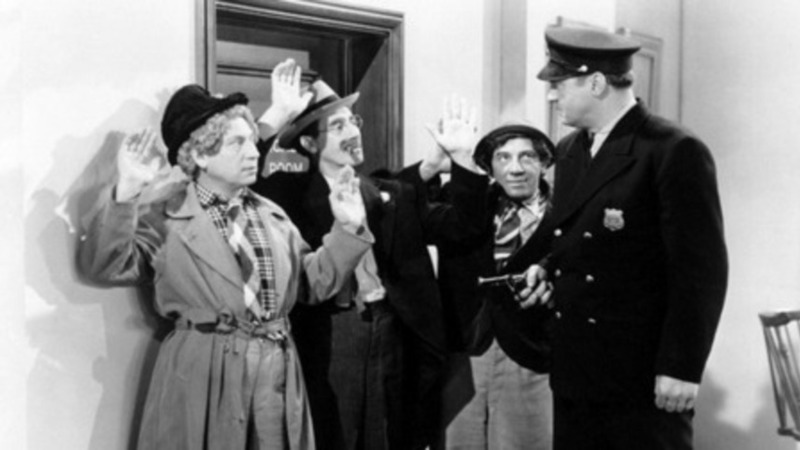 Fearing for the life of her nephew, the co-owner (Margaret Dumont) hires Wolf J. Flywheel (Groucho Marx) as a bodyguard, with the other two Marx Brothers joining the festivities as plot moves forward. This was the last movie the Marx Brothers would make for MGM and the trailer starts out with the announcement that they are retiring from the feature film business. Finally the story starts and we see Miss Phelps hiring Flywheel, followed by some of the madcap hijinks he and the others get into. Then it’s the romance that comes to the forefront as Tommy (Tony Martin) woes Joan (Virginia Grey) with a lovely piano number. There are some shots of the counters and departments that make up the store but it doesn’t get at the real scope of the location or include some of the best gags that take advantage of the breadth of products available, most all of which are put to comedic use. 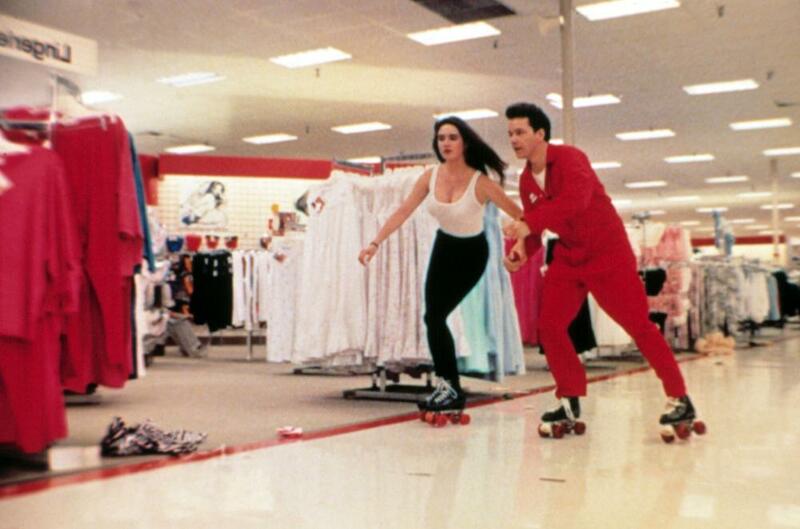 Writer/director Kevin Smith’s 1995 sophomore film expanded the scope of his storytelling from a single store to a whole collection of stores under one roof. TS (Jeremy London) is depressed after Brandi (Claire Forlani) dumps him. Likewise TS’s best friend Brodie (Jason Lee) is angry after being dropped by Rene (Shannon Doherty). 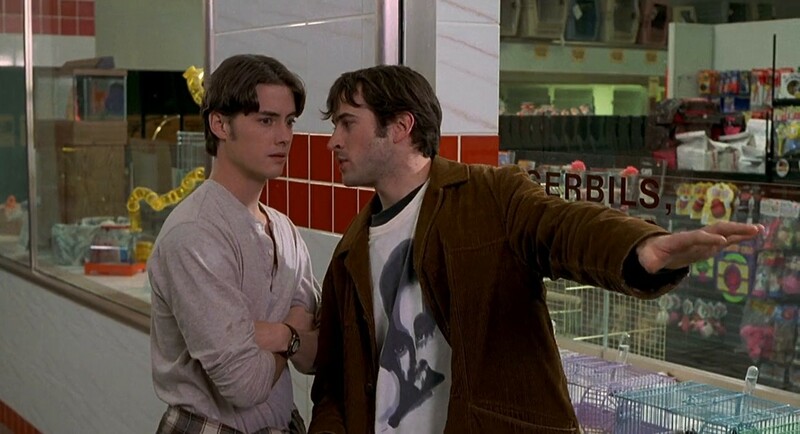 So the two decide to waste their day at the local mall, where they try to woo back their respective girls, sometimes with the aid of Jay and Silent Bob, who take a much more comedic turn here than they did in Clerks. The trailer starts off with the romantic troubles being faced by the guys, particularly Brodie. After that it’s off to the mall, where we see the two getting into all kinds of trouble and engaging in all kinds of pranks that show their total lack of maturity and respect for authority. The locations available in the mall are used to decent effect, but mostly it’s focused on selling the characters. Unfortunately there’s no real arc that’s on display here, it’s just a super-cut of randomness from throughout the movie pulled together for the purpose of selling laughs. 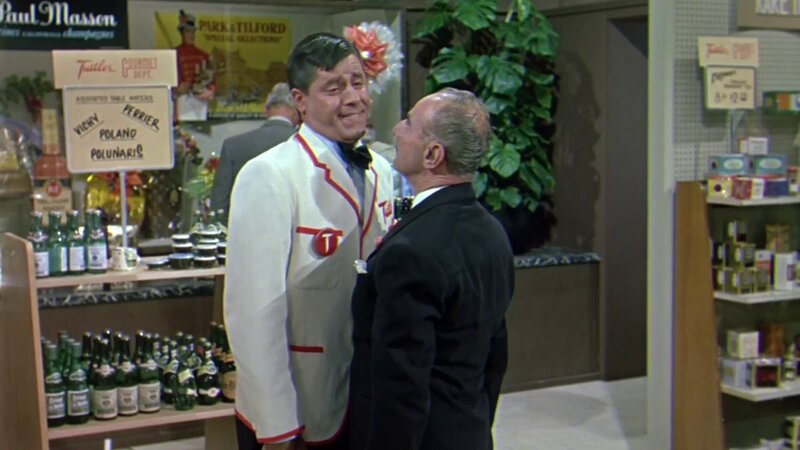 The late Jerry Lewis stars as Norman Whiffer, who worked works in Tuttle Department Store despite being not the brightest bulb in the box. Norman is engaged to Barbara (Jill St. John), the daughter or the owner of the store (Agnes Moorehead), who feels Norman is beneath Barbara. To try and break them up she has Quimby (Ray Watlston), the manager, give Norman a series of difficult jobs in the hopes he’ll fail and Barbara will come to her senses. As the trailer starts we meet the various characters, including the outrageous physical comedy of Lewis. We see him plowing through the different departments, doing different jobs and getting himself into – and out of – one difficult situation after another. There’s a bit about the romance between Norman and Barbara but not much. Instead it’s focused on using as much of the store as possible, including the items available in it, as a backdrop and props for Lewis to engage in his antics around and with. Jonathan (Andrew McCarthy) is a frustrated artist who takes a job designing mannequins. One night as he passes a local department store he sees one of his projects and realizes it’s just about perfect. Through a series of circumstances he winds up working in that store, where one night the mannequin comes to life (played by Kim Cattrall), eventually revealing she’s the spirt of an Egyptian princess who went missing millennia ago. The two begin a very unusual romance that’s complicated by various plot contrivances until the final happily-ever-after ending. Jonathan’s rough career path is shown as the trailer opens but we quickly get to the point that Emmy has come to life, though she reverts back to mannequin form if anyone else shows up. The main point here is to sell a fluffy romantic comedy with lots of opportunity for awkwardness and misunderstanding. Jonathan and Emmy take full advantage of being locked in a department store to try on all the clothing, use the furniture available and more. Worlds collide as Jim (Frank Whaley) takes a job as the overnight janitor at a local Target, the same place where Josie (Jennifer Connelly), the daughter of one of the town’s most respected families, hides out to avoid her parents. Stuck together in the store for the entire night, the two start off avoiding each other but eventually a romance is established. We see Jim’s penchant for overstatement as the trailer opens, but the main initial point is to present it as the latest movie from John Hughes. He eventually takes the job at Target, where he meets Josie while stuck in the store overnight. The two have a bit of fun while they’re there but the fun is interrupted when a pair of burglars break in to rob the place. In addition to Hughes’ involvement, the main point of the trailer is to show off Connelly as the ideal woman, something which wasn’t hard.